See more objects with the tag artists, collectors, art, display, designers, columns, stone, print collectors, inscriptions, title, crack, dedication, slab. See more objects with the color lightgrey darkslategrey dimgrey grey or see all the colors for this object. This object is the first item in a set that contains 3 objects. This is a Book. It is dated 1762 and we acquired it in 1956. Its medium is etching with engraving, original covers of blue board on cream laid paper. It is a part of the Drawings, Prints, and Graphic Design department. 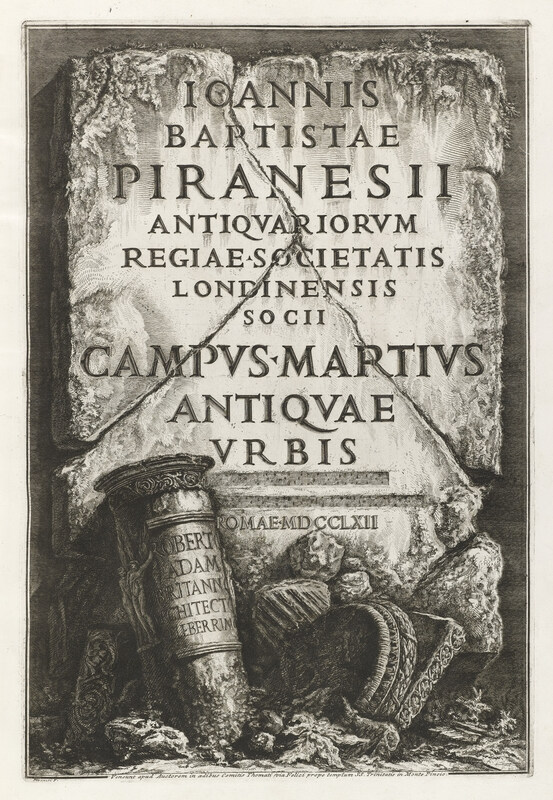 Ruins and decay are dominant themes in this frontispiece for Campus Martius (Campo Marzio in Italian), a publication by the Italian designer and architect Giovanni-Battista Piranesi that reconstructed the ancient historic area on the left bank of the Tiber. The publication was first announced in 1756 but was finally published in 1762. The first edition has two title pages, one in Latin and one in Italian. 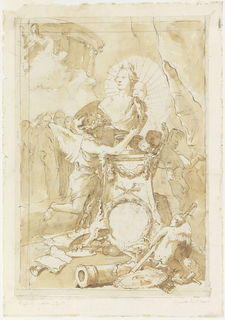 Piranesi’s name, the title, and the date of the publication are carved into the massive stele. This giant stone slab is reminiscent of Piranesi’s etchings of the Severan Marble Plans. These were published in his Antichità Romane (1756) and were copies of the now fragmented map of Rome that were carved on marble slabs in third century CE. Fragmentation would become a key visual strategy in Piranesi’s imaginary and observed views of ancient and contemporary Rome. In front is a ruined column, upon which is a dedication to the Scottish architect Robert Adam with whom Piranesi formed a close friendship after meeting in Rome during the 1750s. Adam, who is known as the pioneer of neoclassical style in England, particularly encouraged Piranesi’ project, which re-imagined imperial Rome by combining artistic imagination and archeological and historical evidences. This object was catalogued by Karin Zonis. pen and brown ink, brush and wash, black chalk on white laid paper. Inscribed in plate, on stone slab: IOANNIS / BAPTISTAE / PIRANESII / ANTIQVAR / ORVM / REGIAE . SOCIETATIS / LONDINENSIS / SO CII / CAMPVS MARTIVS / ANTQVAE / VRBIS / ROMAE . MDCCLXII ; on column: ROBERT / ADAMS / BRITANN[...] / [...] EBER RIM [...]; lower margin: Veneunt apud Auctorem in aedibus Comitis Thomati via Felici prope templum SS. Trinitatis in Monte Pincio.